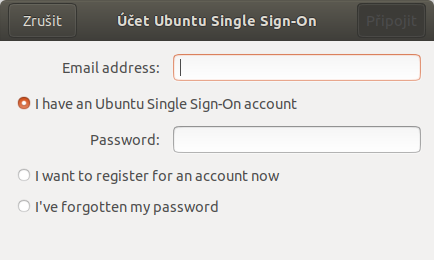 The Ubuntu Single Sign-On account settings was added into Online Accounts in the recent update of Ubuntu 18.04. Unfortunately, it is untranslated on my non-English (Czech) system and unavailable for translation via Launchpad. See the attached screenshot. We need to ask dh_translations for an update of gnome-online-accounts.pot. in order to force an update without the rename trick. This might benefit other packages as well. Question: Does po/Makefile always understand "make $(DOMAIN).pot-update"? > Question: Does po/Makefile always understand "make $(DOMAIN).pot-update"? # at every "make" invocation, only create it when it is missing. # Only "make $(DOMAIN).pot-update" or "make dist" will force an update. I can't tell, though, if that's the case for all packages where dh_translations runs make() to create the .pot file. Then I built gnome-online-accounts locally, and the .pot file was nicely updated. So making that change to dh_translations seems to be an alternative way to handle this bug. Possibly it's the right way. One doubt is whether there is a risk that other packages, whose .pot files are created via this command, have versions of po/Makefile that don't understand the -update suffix. Or maybe it's a standard thing which ought to work in all cases. Another thing is whether there are packages with externally maintained .pot files which we don't want to overwrite this way. For now, if we are not sure about those things, and since it's urgent to make the strings available to the translators, I'd vote for building gnome-online-accounts with the patch I wrote. Those strings are available in LP now.